Pistorius Found Guilty Of Culpable Homicide : The Two-Way The double-amputee track star showed no emotion as the verdict was read in a South African courtroom. He faces a maximum of 15 years on the charge, which is roughly equivalent to manslaughter. Olympic and Paralympic track star Oscar Pistorius listens to Judge Thokozile Masipa (unseen) deliver her verdict at the North Gauteng High Court in Pretoria on Friday. A judge in South Africa handed down a verdict of culpable homicide against double-amputee Olympic and Paralympic runner Oscar Pistorius in the shooting death of his girlfriend. The conviction carries a maximum of 15 years in prison. In ruling for culpable homicide, which is roughly equivalent to manslaughter in the U.S. justice system, Judge Thokozile Masipa found him not guilty of the more serious charge of premeditated murder in a verdict that took two days to present. Masipa said there wasn't sufficient evidence to support the notion that Pistorius, 27, knew that Reeva Steenkamp was behind a locked toilet door in his home when he fired several shots on the morning of Valentine's Day 2013. The judge later granted an extension of bail as Pistorius awaits sentencing, which is set to begin Oct. 13. 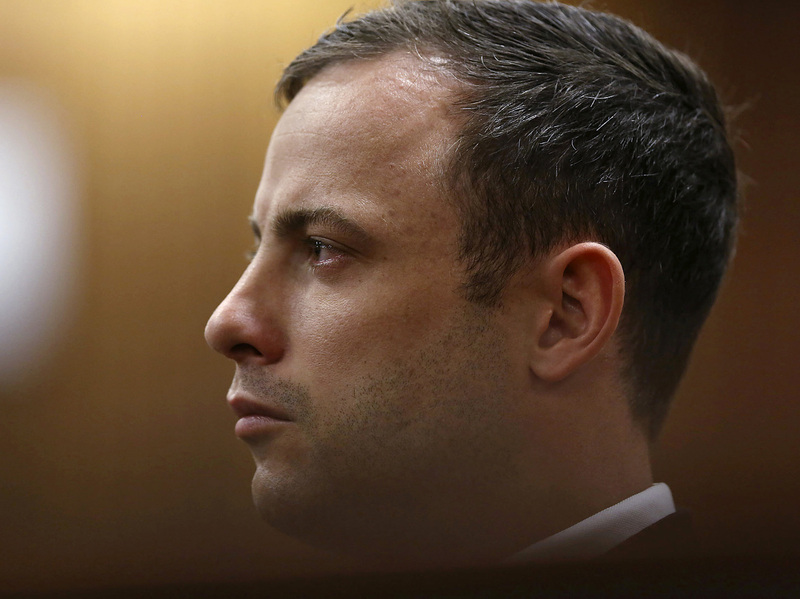 The Associated Press reports: "Unlike many other times during the trial that began in March, Pistorius showed no emotion as he stood in his dark suit with his hands crossed in front of him. The double-amputee Olympian was hugged by relatives when the judge ordered a recess soon after announcing her verdicts." The BBC says that "the athlete, who became emotional on Thursday after being described as an 'evasive witness,' seemed to have been expecting this verdict. The judge had already spoken of his negligence and use of 'excessive force' when he fired through the door." South Africa's National Prosecuting Authority said it would decide whether to appeal after sentencing. [Pistorius] was found not guilty of two of three firearms charges he faced, one of firing a pistol through the sunroof of a moving car, which carried a maximum five-year sentence, and the other for the possession of ammunition, which carried a maximum 15-year sentence. He was found guilty of recklessly firing a gun in public at Tasha's Bistro in Cape Town. That charge could also carry up to five years. Pistorius' friend Darren Fresco, who was involved in two of the firearms incidents, had his immunity from prosecution upheld. He is waiting to hear whether he will be allowed back out on bail. The BBC says that while Pistorius faces up to 15 years on the culpable homicide charge, "legal experts suggest seven to 10 years is more likely when sentence is passed in a couple of weeks."